I was beginning to think my muse was still in bed sick, as more of my creations have hit the trash can in the last few days. I created today's card for CSP111, taking a few creative liberties with the sketch. I rotated the sketch, extended the thin panel, and make it one huge panel instead of blocks. I stamped my images from Natures Silhouette II, in a few of SU's In Colors. I experimented with the colors finding a method to stamping them that was appealing...I stamped the following colors - Kiwi, Baja Breeze, Tangerine Tango, and Pink Pirouette. Staggering my silhouette images across my white card stock. 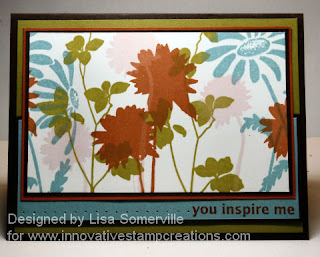 I love your "Natures Silhouette" cards Lisa ... you are very inspiring! Lisa! This is stunning! I love how you worked all of the flower images from this set into one card! I am so sorry you have not been feeling well, but this card sure looks like you are getting your groove back! Great card Lisa, love the colors of it and the flowers overlapping! Those flowers are just so beautiful! I love the colors you picked and great use of that CPS sketch - I like that you made it your own.